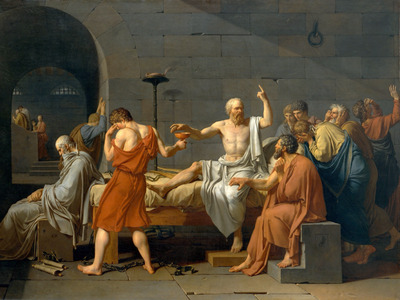 Wikimedia CommonsThe Death of Socrates by David. Socrates was killed by being forced to drink poisoned hemlock. Negative interest rates are a “seeping poison” for the business models of many of the world’s most important financial institutions, and could affect their long-term “viability,” according to new research from analysts at Citi. In a new note from Citi Research, analysts Willem Buiter and Ebrahim Rahbari argue that institutions across the insurance, pensions, and banking sector are being threatened by the persistently low and negative rates. Citing the words of Felix Hufeld, the boss of the Federal Financial Supervisory Authority, Germany’s equivalent of the UK’s Financial Conduct Authority, Citi argues that the “seeping poison” could mean that many institutions, especially money market funds — funds comprised of safe, short-term debts often used by retail investors as a way of making money on a very safe investment — are no longer viable in the long term. Basically, Citi is warning that the negative rates may stop institutions being able to make money, which in turn would hit their ability to pay out on things like pensions and insurance policies. When it comes to the banking sector, Citi points out that: “Banks in large part live off the differentials between lending and borrowing rates or between investment returns and funding rates.” Persistently low interest rates could hit these differentials, lowering profitability and seriously harming banks in the long run. Citi Economics joins a growing number of influential people and institutions criticising negative interest rate policies. Earlier this month, for instance, Deutsche Bank argued that the ECB’s insistence on continuing to use negative rates is putting the entire European project at risk, while Commerzbank is considering taking money out of storage with the ECB and physically storing cash in its own vaults to avoid paying the penalty imposed by negative interest rates. Renowned US investor Jeff Gundlach recently called negative rates the “stupidest idea” he has ever come across.